(Osaka, Japan) While you are what you eat, cells are what they touch. The cells with which it interacts will determine a cell's function, shape, and in some cases even identity. Crucial to these interactions are laminins, a family of adhesion molecules, and integrins, a family of molecules that lie on the cell surface and are receptors for laminins. Among the many laminins, Laminin 511 interests scientists because it is found from the time of the embryo and persists throughout life. Using advanced electron microscopy methods, researchers from the Institute for Protein Research, Osaka University, have uncovered precisely where laminin 511 interacts with integrins. "Laminins consist of 3 chains, alpha, beta and gamma," explains Professor Kiyotoshi Sekiguchi, who led the study. "Each chain interacts differently with integrin." It is known that the specific domains of the alpha chain (LG1-3) and the gamma chain are essential for binding to integrin, but scientists are unsure if the gamma chain directly interacts with integrin or facilitates interaction with LG1-3. "Our previous work showed that the glutamic acid residue in the third position from the C-terminus of the gamma chain is crucial for integrin binding. We do not know if the residue promotes an active LG1-3 conformation or if it interacts directly with integrins," adds Sekiguchi. For glutamic acid to directly interact, it would need to coordinate with a metal ion site in the integrin. To test this hypothesis, Sekiguchi's team observed the integrin-binding fragment of laminin 511 using electron microscopy. Mutations in the fragment confirmed that the glutamic acid coordinates with a metal ion-dependent adhesion site of integrin, arguing the gamma chain directly interacts with integrin. 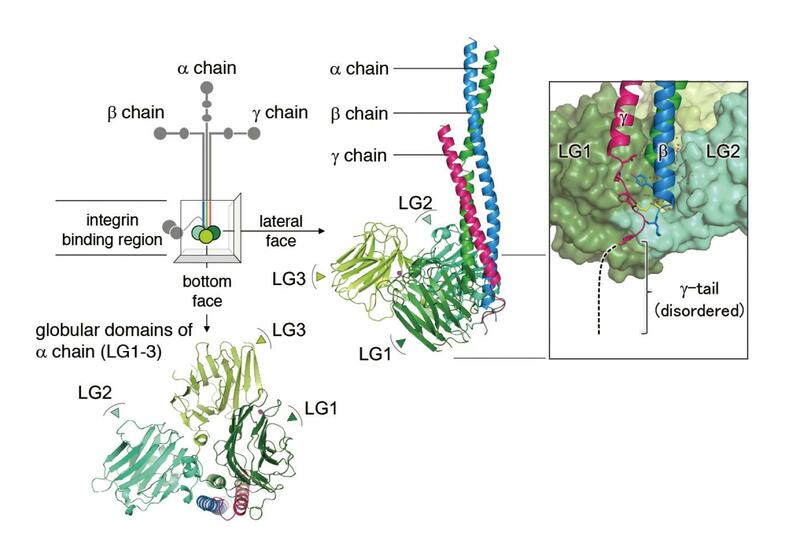 The electron microscopy images indicate the gamma chain interaction stabilizes the laminin-integrin interaction. "LG1-3 brings the gamma tail in close contact with the metal ion-dependent adhesion site. This interaction is important for cell function. Understanding how the interaction is stabilized helps us understand how function is sustained."